Objek wisata pasir putih adalah salah satu objek wisata pantai di Karangasem . Karang unik berbentuk seperti ikan paus di objek wisata pasir putih karangasem . Objek wisata candi dasa adalah salah satu objek wisata di kabupaten karangasem . Tempat membeli oleh - oleh di ubud. Salah satu pemandangan hijau di Ubud. 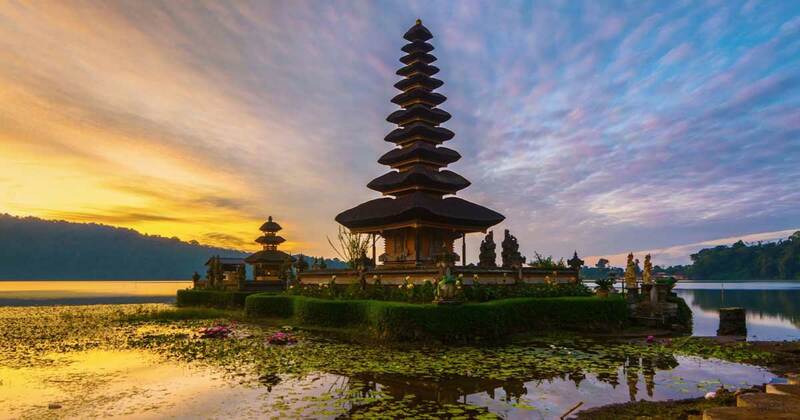 Tirta Empul tourism object is located in Manukaya village, Tampaksiring Gianyar, Bali. Tirta empul is right on the left of the presidential palace on Tampaksiring.Tirta empul is one of the main tourist destinations during a tour in Bali. 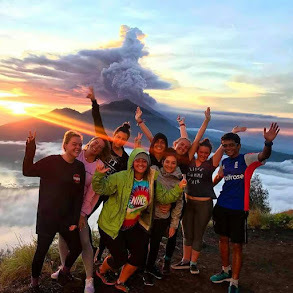 Access to this tourist attraction is quite easy because it is on the tourist route of Ubud - Kintamani, so this place is mandatory for tourists visiting Bali. Tirta empul is a holy bath and sacred by Hindus. Every celebration of Hindu holy day is always crowded by Balinese people to pray and curse or purify themselves. 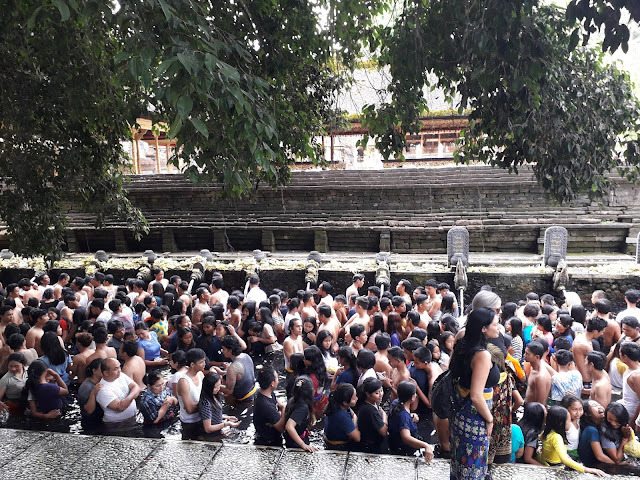 Many tourists visit Tirta Empul and it is not uncommon for tourists to participate Penglukatan, want to feel the freshness of the water in Tirta Empul.Tourists can take a bath and refresh themselves in the next pool of water for begging or purification. For non Hindus if want to feel the spiritual aura from tirta empul, You can purify yourself and must pay attention to the terms and conditions and you will feel a different of spiritual tourism. the atmosphere of this place is calm and peaceful. a temple in the upstream of the bathhouse. Used by residents as a place of worship after completing the practice of purification. 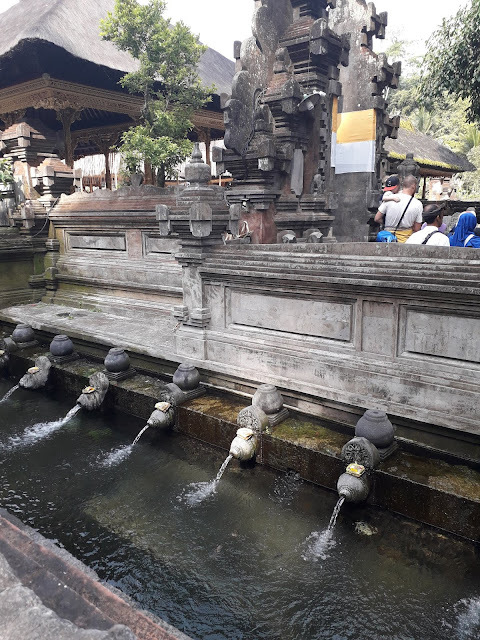 Aside from being a tourist spot, for the Hindus Tirta Empul Tampaksiring this is a sacred place that is very sanctified. Every holy day for Hindus this place is always crowded with people who want to curse and pray. It is not uncommon to queue at this bathing place full and willing to queue for a long time, if on normal days it's rather quiet. well this is where the opportunity for tourists to feel the freshness of the purified natural spring. Bathing areas will always be crowded during Hindu religious holy days. like when the moon is full or full moon, especially during the Banyupinaruh celebration the day after Saraswati Day. Tempat ini dipastikan akan membludak dipenuhi warga Hindu. Tirta Empul, has a unique mithology and is still trusted by the inhabitants of this island even today, this story arises from the story of the despotic Balinese King named Maya Denawa, the king made his people anxious and miserable, this incident made the Heavenly God concerned, then the God of Heaven sent his troops, led by Dewa Indra.Maya Denawa itself is so powerful that it is hard to conquer, because Denawa's magic power also creates a river that flows poisonous water that makes the Lord's troops poisoned, with his magic Lord Indra sticks his stick so that water appears (now called Tirta Empul) to sprinkle many god Indra's troops poisoned , so it's healthy as usual. And finally Maya Denawa can be destroyed.to go to Tirta Empul - Tampaksiring, from the airport it takes about 70 minutes to drive, of course the choice is you can drive your own vehicle or use a car rental service in Bali and then continue the tour to Kintamani, Tegalalang and Ubud attractions.If holiday in bali don't forget to visit the Tirta empul tourist attraction. 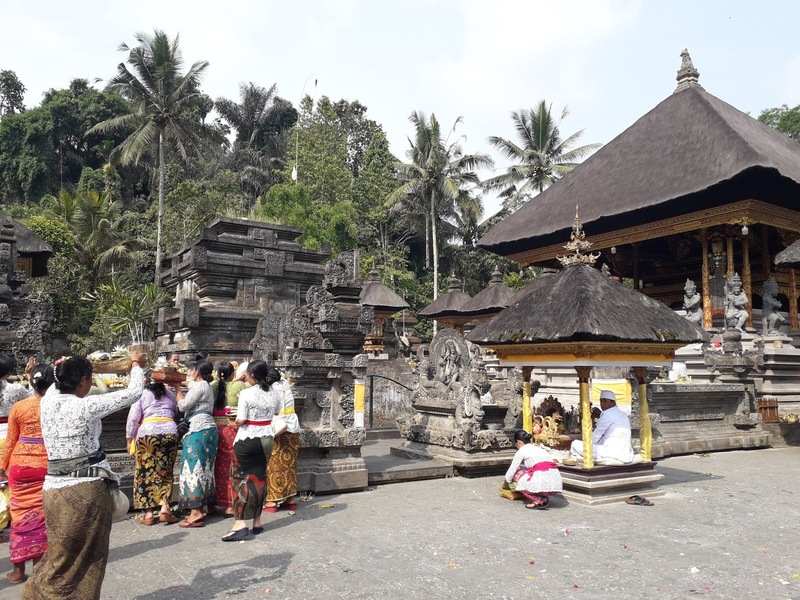 This time I will share about my experience of melukat in Tamba Waras Temple precisely I go there with family after Nyepi day, where melukat in Tamba Waras Tample located in Sengketan Village Penebel Tabanan District Bali is very crowded visited to melukat . The road is quite narrow so you want to plan to melukat in Pura Tamba Waras to be careful when passing. Info that I get Tamba Waras Temple trekking is crowded from 7 am and right at noon at 1 noon is getting quiet and hot and time to rest but when I will return at 3 pm, start again many pemedek that come to melukat. As for some things that need to be prepared to do the trespassing at Pura Tamba Waras is 2 pieces of pejati which will be placed in the place of pelukatan and the time of praying at Pura Tamba Waras after melukat and some canang sari or ceper to offerings in some pelinggih and 7 water pancoran. In addition you must prepare the klungah or coconut yellow and green bungkak or coconut as much as 1 person 1 fruit. This coconut can you prepare directly from the house or around the road to the temple area of ​​many residents who sell for 5 thousand, even in the temple parking area there is also a sell only parking area located in the western you may have to rotate to the parking area from common parking area. When pemedek do pengelukatan will be accompanied by some stakeholders or pengempon pengelukatan. As for some things suggested by the pengempon that is when melukat under the pancoran wash face and head by covering the water by hand do not immediately flushed your head with water. Steps taken are first gargle 3 times then shoot or drink as much as 3 times and last wash face and head 3 times. After passing the pancoran, you will be cleaned back by the pemangku with nunas tirta then flushed with water klungah earlier. Next you walk to the yoga bench in the next part of the pelinggih or above where you first pray to ask for or nunas the last tirta. According to some information from pemedek, if pemedek who experience non-medical pain will feel nauseous when doing pengelukatan. 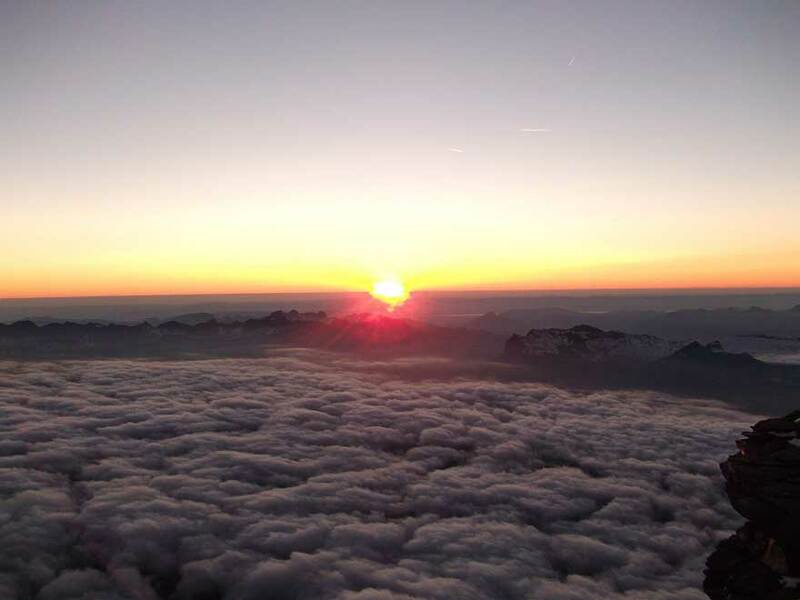 Sure enough when I will come home there is one pemedek who kerauhan or possessed and shouted, according to other pemedek it is fair because the magical creature that reside in the pemedek refuses to be trained. Pancoran Penetration Sapta Ganga Pura Tamba Waras is indeed known not to clean themselves as in Pura Tirta Empul but melukat to eliminate both medical pain and especially non-medical pain disorder. After the melukat you can immediately change your clothes, just calm down because there are already several places to change clothes near the place to melukat or bathroom in the parking area. After that you can directly go to the madya Luhur Tamba Waras Temple area to do the praying. In addition to the observed pejati, here also you offering green bungkak or coconut was by opening the first coconut shell and put it on a sokasi or container pejati. Relax because in the back of the temple has been provided a machete to open a coconut shell or you can immediately prepare it open at home. After mengahunkkan pegati and coconut bungkak, stakeholders will start the worship ceremony.After praying you can melungsur or nyurud coconut bungkak earlier and drink it in the area of jaban temple or outside the temple. This coconut bungkak will be a medium to treat you for those who suffer from medical and non medical pain. Coconut bungkak will be given a little oil by pengempon temple mixed into coconut water, try to drink until finished. That's my experience when doing melukat in Pura Tamba Waras, so much that I can share and hopefully useful. Jati luwih Village Tabanan Bali, Located in penebel area, Tabanan regency, Bali. 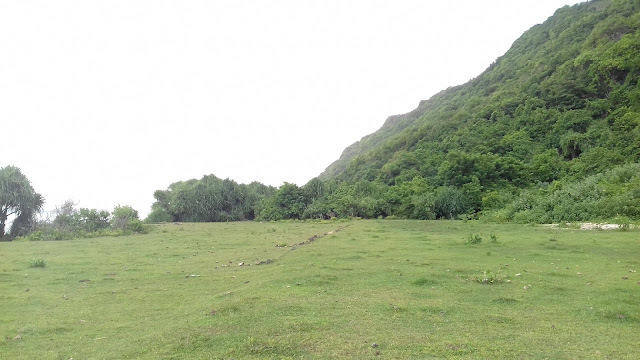 Located at an altitude of 700 meters above sea level, is an area adjacent to BatuKaru Mountain. Most of the area is a rice field area arranged terraces, the extent of about 636 hectares of terraced fields, so this area becomes the largest area for rice field terraces in Bali, and watering system in use is watering Subak. The traditional Balinese irrigation system is community based. In additional to the terraced rice paddies, you can also enjoy the view of the river, temples, and home the house are still simple. The countryside is completely natural and peaceful. The origin of Jatiluwih Village name consists of the word "Jati" and "Luwih" which means really beautiful, Almost every day Jatiluwih Village Penebel Tabanan crowded in visiting domestic and foreign tourists. With a rustic natural atmosphere with typical terraces, Really beautiful and interesting. 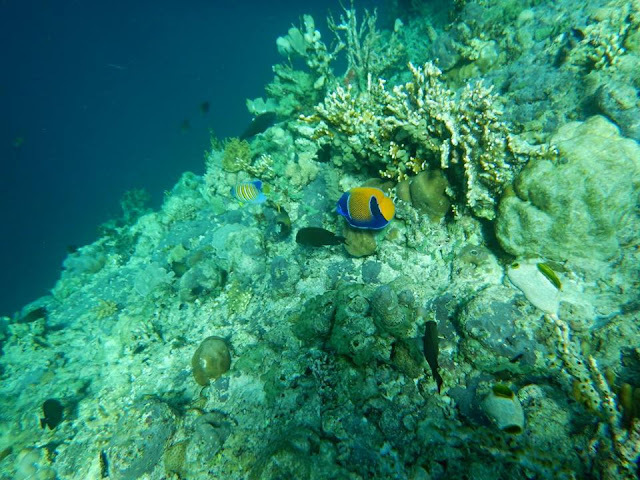 One of the interesting activities to Bali is Snorkeling tour. Snorkeling is one type of rides that can be enjoyed at sea. 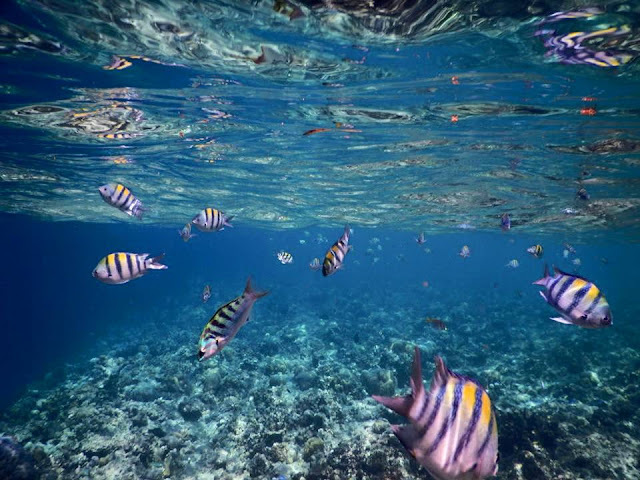 Snorkeling is usually done by diving to the seabed. But the depth of the sea is not deep and only shallow. This snorkel uses swimming goggles, buoys, frog shoes, oxygen hose, and so on. 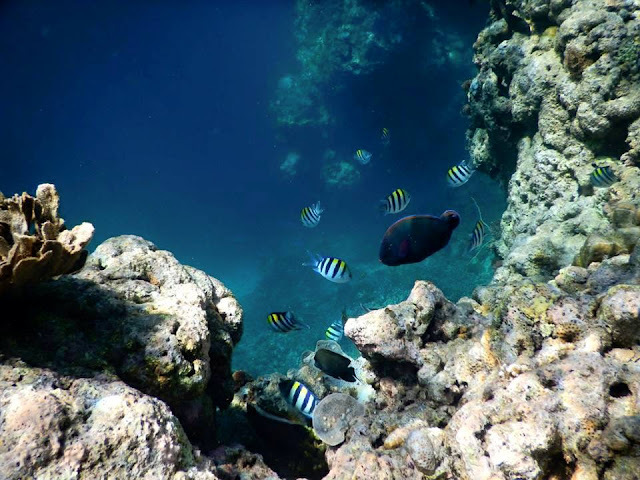 Well this time you can do snorkeling in Menjangan Island, which is located on the island of Bali. 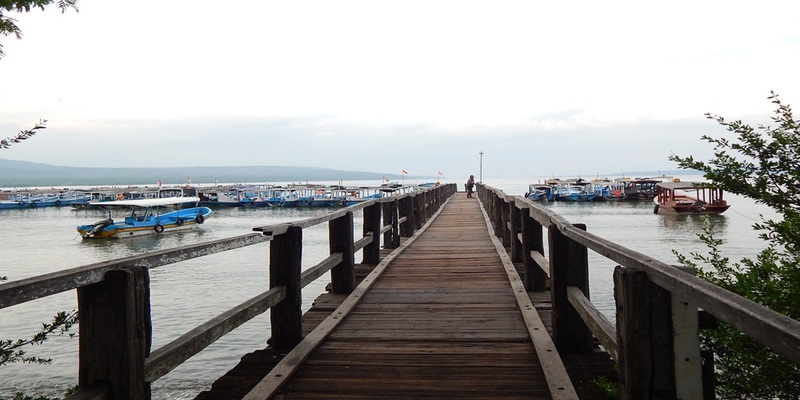 Here is a dock that is on Menjangan Island. Menjangan Island is not far from the location of Gilimanuk port. You can travel not too long, which is only about 15 kilometers from the port. 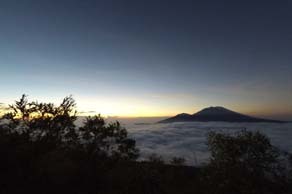 Menjangan Island is located in the western part of Bali bordering the district of Buleleng and also Jembrana district. The location is very strategic and easy to reach. To be able to do snorkeling on Menjangan Island, you can board a boat to get to the dock Banyuwedang. This journey takes 30 to 40 minutes. Then you can get to where you're headed. 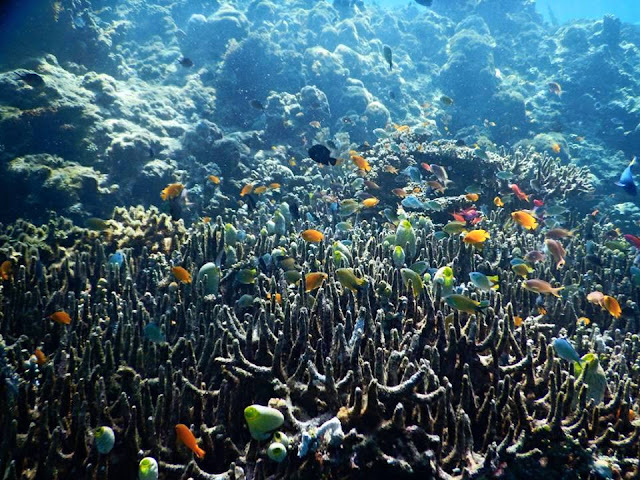 Here are the underwater beauty that can be enjoyed on the menjangan island . For friends who vacation to Bali do not miss the experience of snorkeling to see the beauty of nature under the sea on the Menjangan island. Nyang Nyang Beach Bali is one of the white sand beaches located on the southern island of Bali, precisely on Jl. Uluwatu, Br. Boma Coral Service, Pecatu, Kuta Badung, Bali. Nyang Nyang Beach has a very close distance to Uluwatu Temple, one of the favorite tourist attractions of domestic tourists while on the island of Bali. Nyang Nyang Beach Bali is behind the hill, has clean white sand and the slope of the beach is very gentle and wide. It takes extra effort and stamina fit to get to the beach. Because the access road is still steep and the car or motorcycle can not reach the beach so it must walk from the top of the parking lot to the beach. 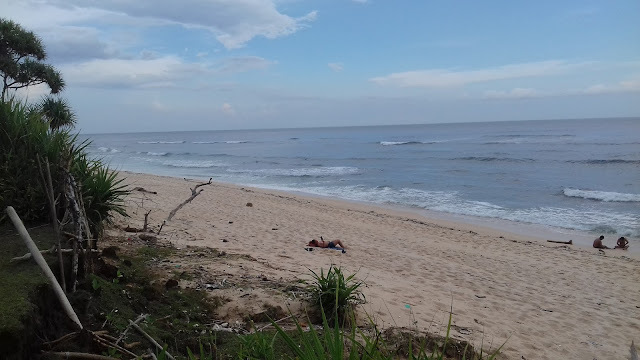 Your tiredness will be paid off after you arrive at the beach, the sea view that connects the coast with the Indian Ocean will be found on Nyang Nyang beach. 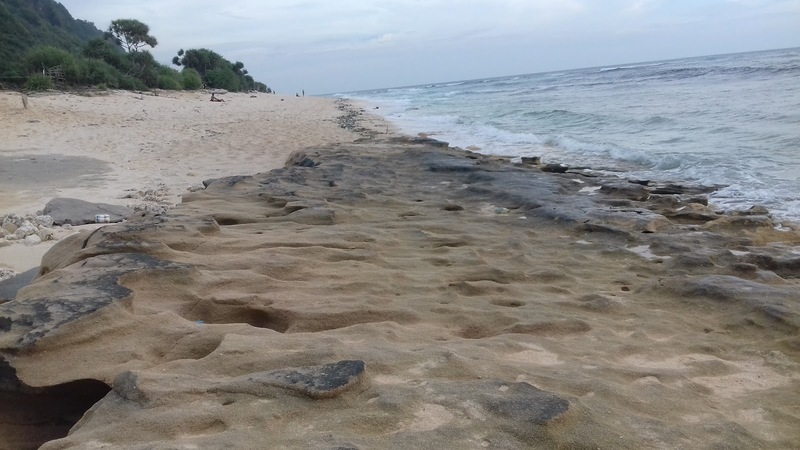 If you are planning a vacation to Nyang Nyang beach Bali, you should use the vehicle in good condition, because the road you will take is the limestone soil with rock conditions scattered on the streets, especially in the rainy season will be more difficult to pass the muddy road conditions and slippery. Nyang Nyang Beach condition is still natural, very few visitors on this beach, only a few foreign tourists who love surfing sports that often come to Nyang Nyang beach. Nyang Nyang Uluwatu beach is suitable for surfing, because the beach has a big wave. 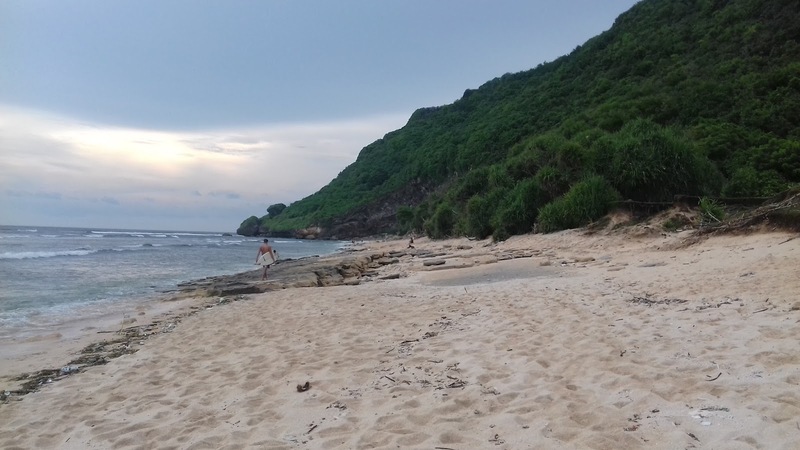 Activities that can be done on the Nyang Nyang beach Uluwatu in addition to surfing, you can swim or just sit back while watching the ocean view with the waves and also you can walk on the white sand with tekstru slightly rough. At Nyang Nyang beach you can see some scalloped shells, while looking at the beauty of the cliffs that are green, looking very beautiful from a distance. Vacation posts Day 2 Bali Nusa Lembongan is a continuation of the previous article First Day Holiday Bali Nusa Lembongan. This time we will share holiday experiences in lembongan on day 2. On day 2 we are planning to visit the object that we have not visited before, namely Mangrove Forest Toure, Panorama Point and procession Tear. 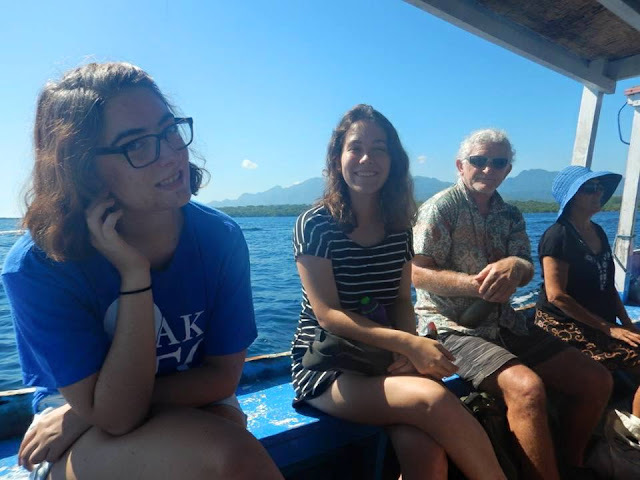 Because the boat we were riding back to Sanur to leave at 4 pm so we do not want to waste time to go to the lush mangrove forest, Panorama Point and Water Blow Nusa Lembongan known as the procession Tear. But before we breakfest first let more vibrant and powerful. At that time we've been waking up at 8 in the morning and enjoy breakfast already prepared at the hotel. Thereafter no strings attached we went straight to our first goal is Mangove Forest Tour. Finished breakfast at around 9 am, we hurried to the first destination that is Mangrove Forest. Why mangrove forest? From some references that I had a good read is the most visited mangrove forest in the morning, because in the morning, the water of the sea will rise to the mangrove area of water in the area so the atmosphere will be very nice mangrove and water is also visible clear. So to enjoy the beauty of the Mangrove Forest there we had to hire the services of a small skiff who escorted us around the mangrove forest about 30 minutes. So the skiff we were riding can be for 2 people and a maximum of 4 people. Here is a Mangrove Forest Nusa Lembongan atmosphere that is so beautiful and natural. After touring the mangrove forest we continue the journey to Panorama Point. Panorama point is a spot with a view lembongan village located alongside a road. Here is a very nice photo spot. Where blend incredibly maximum. There are mountains, the sea and residential population. 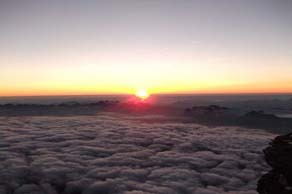 After enjoying the view at Panorama Point we continue the journey to the next object that is Defil Tear. Defil Tear is a Nusa Lembongan water blow is like Water Blow Nusa Dua but it is even more amazing because of the waves and the reefs more large. From there scene stretch of reef, so beautiful. Actually we had already checked out of the hotel at 12 noon, but we ask the hotel caretaker, for entrusted goods in the front office. So before the streets I suggest to first packing his belongings, in case the real hell wrote. It does not seem at all willing, to leave the island and realizing our vacation time is up and we also are ready to Sanur. Nusa Lembongan is one of the small islands of the three other islands of Nusa Penida, Nusa Ceningan, and Nusa Lembongan itself. Although only a small island, but Nusa Lembongan provides a wide range of facilities that can be enjoyed by every visitor. When asked about the environmental conditions of Nusa Lembongan, then the answer is guaranteed still green and look very charming. 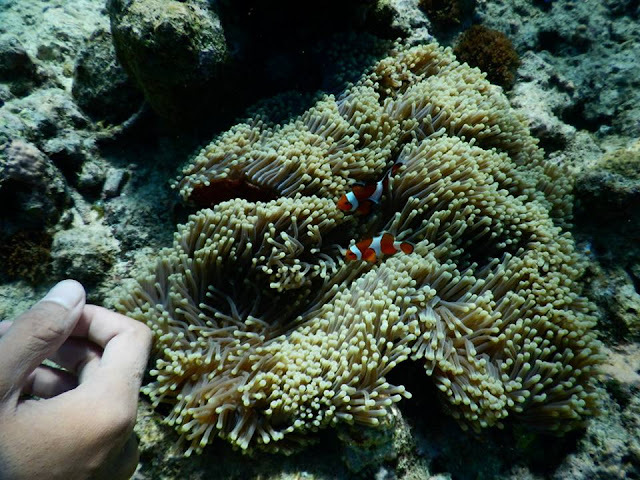 Coupled with the facilities provided on this island like a hotel , bungalows, restaurants, area Balinese art performances, and underwater attraction to enjoy the beauty of coral reefs and other marine life. To reach Nusa Lembongan, you need to Sanur before, because the boat crossing to Lembongan are in Sanur. Indeed, there is a path through the port of Padang Bai or Benoa, but the line was still no definite timetable like ships of Sanur there almost every hour. To reach Sanur can use gojek, bus or driven by a friend. But, if the motor is also allowed to bring, in Sanur there is provided daycare motors. Just be a little less secure because there are many who have lost helmet. The main activities to do in Lembongan is walk around and relax in white sand beach in Lembongan. From the south end to the north end, the island is very interesting because each region offers its own uniqueness. to enjoy all the objects in Nusa Lembongan and Nusa Ceningan simply by 2 days 1 night. To get around the area can use a motorbike. 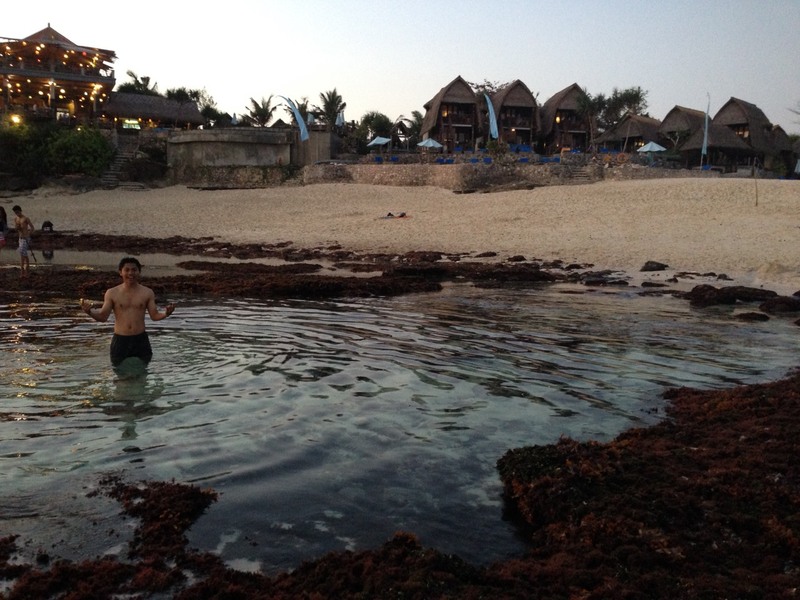 For the first day we visited vacation spot seaweed cultivation, gala - gala cave, Jumping area, blue lagoon and dream beach. Here is where the cultivation of seaweed, seaweed cultivation place is like rice fild for the residents of Nusa Lembongan because most people there are seaweed farmers. Not far from where the cultivation of seaweed we could visit gale - gale Cave. It is said that gale - gale Cave earlier times used for the penance and meditation. Here is where to enter the cave and in the state of Gala - Gala Cave. After visiting Gale - gale Cave we headed to Ceningan visit the jumping area and blue lagoon. From lembongan to Ceningan we run through crossing a yellow bridge that could only be passed by a motorcycle. Having run through a few minutes journey we arrived at the first object that we visit in Ceningan. Once the place is used for jumping area known as Jumping Cilff but fitted us there Jumping Cilff says he has closed, so we continue the journey to the second object is not far from the blue lagoon there is a place to test the adrenaline like flying fox among the steep cliffs. from there we can enjoy the view of the cliffs and rocks so beautiful. After that, because it was the afternoon we continue the journey to Dream beach. Dream Beach adalah salah satu pantai yang indah di nusa lembongan. Pantainya masih asri dan bersih pasirnya juga berwarna putih dan buliran pasirnya terasa berbeda dengan buliran pasir putih di tempat lain. dan pada sore hari ombak disana tenang jadi cocok untuk bersanatai dan berendam. Dream Beach is one of the beautiful beaches in Nusa Lembongan. The beaches are still beautiful and clean, sand is also white and feels different with white sand elsewhere. and in the afternoon there waves calm so suitable for rest and soak. The Bukit Campuha Ubud Bali " Sunset Hill"